My inquiry question is “how are graphic novel components altered in order to appeal to different demographics?” I was drawn to this question as an add-on from last year’s ZIP. My goal this year was to create original graphic novels based on my research. 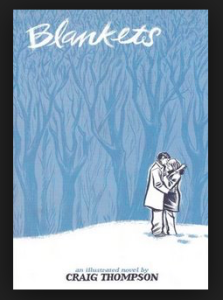 Graphic novels focus on the connection between words and drawings which appealed to me since I’m not the best with telling stories using words only. As I grew up, the styles of graphic novels changed as I read more of them. I thought about how the authors altered the story context and style for different demographics. My question stayed the same throughout the project but I expanded my research to include the effects of brain development. My question allowed me to create a final artifact and provided a straightforward goal. Since my research process this year was taken from reading graphic novels borrowed from libraries, I expanded on my researching skills by retrieving information from personal notetaking. The internet didn’t provide any useful information on the differences between children and adolescent graphic novels, so I relied on my intuition and existing knowledge to guide my learning. I can apply this skill to classes involving independent research. Graphic novels aimed at young children include colourful drawings, simple-designed characters, lots of 2D symbols showing 3D effects, distinct facial expressions, and words that depict actions. The visual cortex in the brain of a child develops rapidly compared to other parts such as the limbic system and prefrontal cortex. This results in children being stimulated by colour and shapes. There are generally little to no dialogue but rather words that express sounds such as “clank”, “boom”, and “crunch”. Many symbols are used including “z” that show sleep, lightbulbs that mean there’s an idea, and thought bubbles that show the character wants or is thinking about something. This all relates to visual expressions in graphic novels but are more prominent in ones aimed at children. As for the story context, the plot is kept simple and shallow. The story is drawn in mostly moment to moment frame progressions for easy understanding. There is a clear beginning and middle with an ending that usually concludes with a happy and cheerful tone. Hocus Pocus tells the story of a magician’s rabbit and dog. The plot includes funny interactions between the two characters as they quarrel from accidental slips to the shift of advantages between the characters. 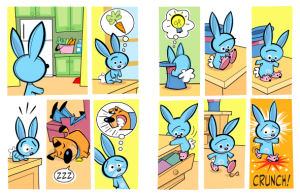 With the bright blue colour of the rabbit and many symbols to help show actions, this book draws the attention of children. 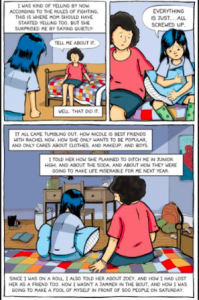 Adolescent graphic novels focus on emotional and relatable stories. In teenagers, the limbic system takes over the visual cortex and emotions are strongly developed. Common graphic novel topics for teenagers include love/relationships, friendships, fantasy-adventure, and high school drama. The art styles are sometimes on the abstract side with more black and white shading than colourful drawings. Frame progressions include all six types which give the graphic novels a mysterious tone with room for readers to interpret details. 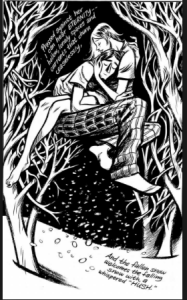 Overall, adolescent graphic novels connect with the emotions of teenagers. Blankets touch on religious and abusive topics that bridge the character’s struggles to the development of a relationship. With an abstract, black and white art style, it captures the emotions of the story. 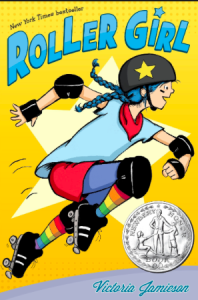 Roller Girl is about a girl struggling with her personal goals and friendships. Many readers can relate to her character growth from an anxious “nobody” to a confident roller derby skater. This story shows how an individual’s internal doubts can be solved by communicating with others. My final artifacts are two graphic novels created by yours truly. One titled Glen’s Cloudy Day for children and the other titled Insomnia for teens. This accomplishes my third curricular competency -> “transform ideas and information to create original texts”. They demonstrate the differences between their targeted demographics. I am able to “recognize and appreciate how different features, forms and genres of texts reflect different purposes, audiences, and messages”. The different techniques are shown in each graphic novel. In Glen’s Cloudy Day, there are no words but a lot of thought bubbles and character facial expressions are used in place of them to convey emotions and actions. The bright colours of the flower fields and the gloominess of the clouds all contribute to the visual focus of the book. The humorous ways that Glen uses to wake up his friends bring happiness to young readers. All frame progressions are moment-to-moment and the shapes are all kept simple. This shows my learning and connects to my second competency, “select and use appropriate features, forms, and genres according to audience, purpose, and message”. This book was also used last year in my research and provides detailed tips and tricks in designing panel to panel stories from different frame layouts, progressions, reality/abstract art, and the overall creation of graphic novels. Helped with drawing my own books and setting the pages up. This book shows how impactful crosshatching and shading can be. Drawn in only black and white, the focus is shifted to the story plot and not any colourful images. Blankets is highly rated by teenagers because of its emotion-filled story. A great example of how different art styles are between children and teenage graphic novels. This story allows readers who are going through the same struggles to connect with the main character. Its already been summarized above but readers going through friendship problems can take inspiration. More colourful than Blankets and focuses on the connection between dialogue and art. This graphic novel is a simple and fun book aimed at children. It provided lots of examples including how symbols are used to accentuate certain actions, the easy to draw characters, and how it conveys excitement, happiness, anger, etc although there is no dialogue. My graphic novels will be read only by TALONS classmates and teachers. If there was a chance to have other children and teenagers read this, what would the reactions be? Would kids actually like my story? New inquiry questions would be how I can take feedback from children and peers to enhance my graphic novels. How does an author communicate with their readers to improve their stories?